In a Dutch oven or a large deep skillet, heat the olive oil, two turns of the pan, over medium-high heat. Add the beef and cook, breaking it into pieces with a spoon, until browned, about 5 minutes. Add the chili powder, espresso powder, coriander and cumin, and season with salt and pepper. Cook stirring constantly, about 1 minute. Add the onions, garlic and jalapeño. Partially cover and cook, stirring occasionally, until the vegetables soften, 6-8 minutes. Add tomato paste; stirring until blended, then add the stock, beans and Worcestershire sauce. Bring to a bubble then reduce the heat to low and let simmer, stirring often until flavors combine, about 5 minutes. Serve chili in shallow bowls with toppings of choice. In Recipes-list.com we have selected the most viewed recipes from category - uncategorized . Enjoy the best recipes specially selected for you! 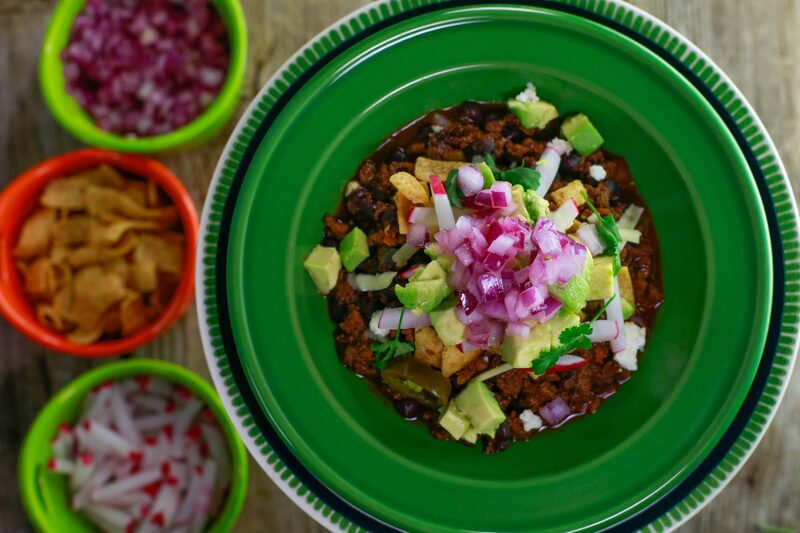 Espresso Chili with Beef and Black Beans is the right choice that will satisfy all your claims.